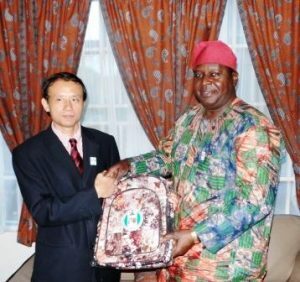 Otunba Olusegun Runsewe, DG NCAC presenting a uniquely made in Nigeria children’s school bag (adire fabric) to Mr. Li Xuda, Chinese Cultural Counselor who paid a courtesy visit to the Culture Headquarters recently. 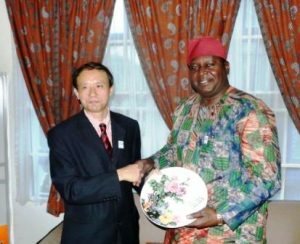 In reciprocating the gift given to him during the courtesy visit, Mr. Li Xuda presented a Chinese National Flower colourfully designed in a ceramic plate to the DG NCAC, Otunba Olusegun Runsewe in his office. 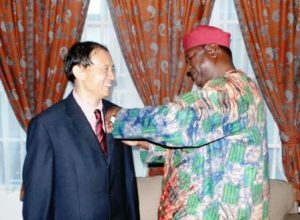 NCAC DG, Otunba Olusegun Runsewe brands Mr. Li Xuda, Chinese Cultural Counselor with the pin crest of the Council, OUR CULTURE OUR PRIDE in his office, Abuja.